The 4Teens Area on the 2nd floor is just for grades 6-12 / ages 12-17! Come hang out on our comfy furniture and see what's going on! We have a ton of young adult books for you to enjoy! Our large fiction collection includes old favorites and the newest and most popular books. We have a selection of non-fiction, as well as audio books, magazines, graphic novels and manga. Watch a movie with a friend at our DVD station. Limit of 2 people at a time. 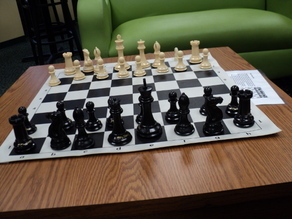 We have board games and more for in-library use, including a chess set, as well as activity sheets for when you need something quick to entertain you. Come see what other fun activities we have going on! Six computers with headphones are available for use by teens in 6th through 12th grade. Computer use is limited to one hour per day for each patron. Use your library card to sign in, or ask at the desk for a temporary pass. The Monroe Public Library does not filter internet access, and cannot guarantee supervision of internet use. Parents & guardians should discuss safe and appropriate internet use with their children. Please see our full Policy on Computers & Internet Use for more information. Students ages 13 and older may have unlimited time at the library as long as their behavior is not disruptive. Please see our full ​Policy on Unattended Children and ﻿Policy on Appropriate Library Behavior﻿ for more information.